Alongside Mailbox for Mac and Android, Dropbox announced an entirely new app today at an event in San Francisco. 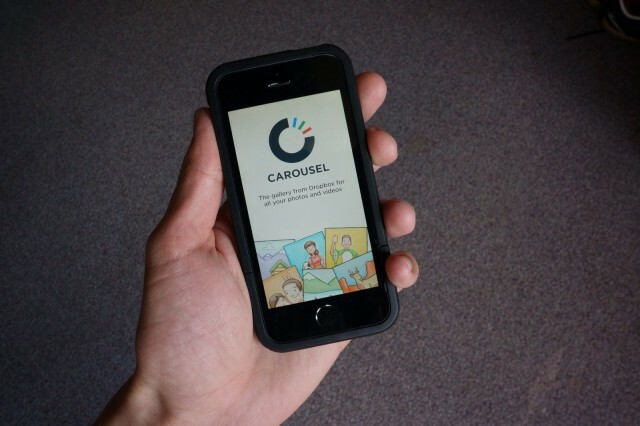 It’s called Carousel, and it’s coming to the App Store and Google Play later today. Think of it like a Photo Stream replacement that might actually work. Dropbox is capitalizing on its fast syncing and uploading capabilities by providing its own photo/video manager. Contacts in your address book can be sent links to view your media directly within the app. The interface looks largely driven by photo tiles and swipe gestures. Dropbox really prides itself on clean, minimalistic design, and it shows in Carousel. At first glance, it looks like Dropbox is borrowing heavily from Apple’s ‘Moments’ system of collecting batches of photos in the Camera Roll. I like using Carousel, but don’t make the same mistake I did when setting it up. Unless you want Dropbox to automatically backup all of your photos, do not agree when it asks to do so. I have not been able to find a way to turn backup off. Dropbox is clearly trying to get your media in the cloud without you having to think about it; so make sure you’re OK with that. Carousel isn’t out yet, but it should be hitting the App Store any moment now. Update: It’s out in the App Store!